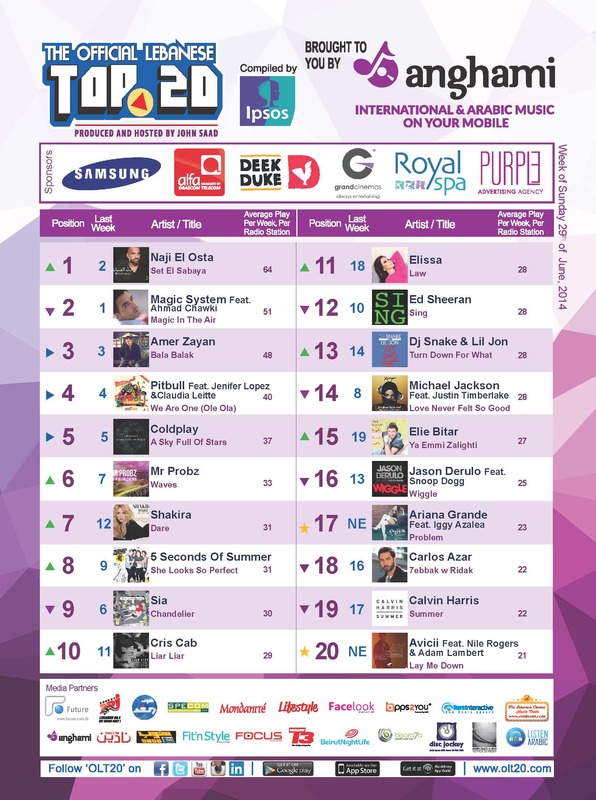 After 5 consecutive Number 1 songs from local Artists, and after French act Magic System featuring Moroccan singer Ahmad Chawki was able to hit the Top of the chart with “Magic In The Air”, it’s back to the local armada of artists to hit Number 1 as Naji Osta goes back to the Top with “Set El Sabaya” his 6th Lebanese Number 1 after “Kebrani B Rassa, Kezzabi Enti, Mich Tabi3i, 3ataki 3omro, & Ossit Watan”! Osta is the only Lebanese act to Top the Chart with as many songs, in fact he’s the only act ever to Top the Chart with as many songs! Congratulations..
From the New Entries of the week, we have “Problem” at Number 17 from American recording artist Ariana Grande, featuring a guest appearance from Australian recording artist Iggy Azalea, and “Lay Me Down” at Number 20 from Swedish producer Avicii featuring Nile Rogers, and uncredited vocals by singer-songwriter Adam Lambert. On OLT20 this week we have 5 Local and Regional artists, and 15 Occidental ones! Note that you can check out the latest videos from your favorite singers on the TV show “Hits N Bits / OLT20” on Future TV every Friday evening around 11:00pm, and Sunday evening at around 7pm for the re-run. Older PostWe Made History with Jim Beam Rocks!